Spend less time setting up your gear and more time enjoying it. The new L1 Model 1S portable line array system delivers a potent combination of portability and performance. It’s compact and light enough to make setup quick and easy, yet powerful enough to fill a mid-sized venue. This system works well for solo musicians, bands and public speakers. Includes one B1 bass module for enhanced low-end performance. The vertical configuration of the system’s small, closely spaced drivers allows the L1 Model 1S system to project sound forward and to the sides—delivering 180-degree coverage—but very little up and down, reducing unwanted reverberation. 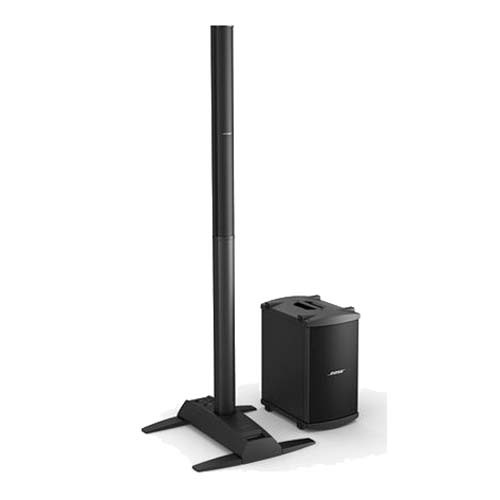 This produces consistent tonal balance as sound spreads more evenly across the stage and into the audience, and the volume level drops off much more slowly than with a conventional speaker. Unique Bose® technologies enable the system to serve as both PA and monitor. It can be positioned behind or to the side of the performer—and you hear just what the audience hears. You’re in control, and there’s no need for conventional monitors, mixers and PA systems. With the L1 Model 1S system you can add a second B1 module or power one B2 bass module for more flexibility and even greater power. Analog input, trim control and signal/clip LED for line-level analog input via ¼” TRS phone cable. Can be used for instruments or other audio sources like DJ mixers, MP3 players, computers or DVD systems. Bass module out for amplified bass output signal to the bass module. L1 system automatically adjusts equalization appropriately when bass modules are connected. The B2 bass module delivers the most low-frequency output for L1® system users who need more powerful bass for larger audiences. The rugged enclosure encases two 10-inch woofers. A switch on the rear panel offers the flexibility of three output levels, depending on application or preference. The L1 system automatically senses and equalizes the chosen setting for optimized performance. The normal setting is ideal for bass guitar or when miking a kick drum. A higher setting is designed for DJ/music playback applications. And the lower setting works well for acoustic guitar and vocals.